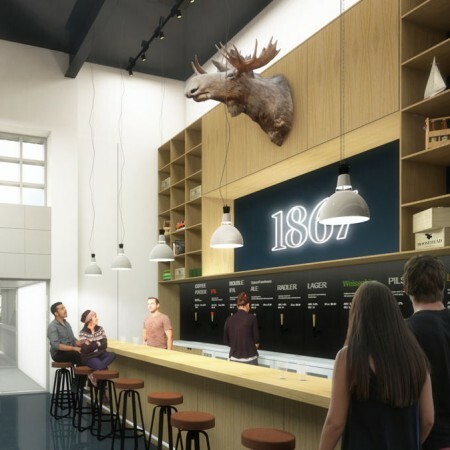 SAINT JOHN, NB – Following on an initial announcement last autumn, Moosehead Breweries has released further details about the concept and design of its upcoming Moosehead Small Batch Brewery. The brewery and tap room will feature a sophisticated, yet rough material pallet of woods, leathers, stainless steel, and the iconic moose. The exterior of the space alongside Moosehead’s historic West Side brewery, will feature weathering steel. This unique steel, which oxidizes quickly, pays tribute to Saint John’s manufacturing and port industries. The colour is like copper which also reflects historic brewing vessels. It’s a resilient material that isn’t fancy or fussy – and that’s very much Moosehead. The Small Batch Brewery will include a 20-barrel brewing system and 3-barrel pilot system, as well as a tap room, growler station, beer store, and merchandise shop. For more details, see the full announcement on the Moosehead website, as well as the Moosehead Small Batch Brewery Facebook page.